Audra Jennings: Enjoy mysteries? You'll enjoy The Corruptible! I've made the decision to just read books written by men for a while. That's not completely true for a few reasons, but as far as my strictly "for fun" choices, I'm going to stick by that. No ooey-gooey romance. I want my conflict to be more than just "should I go out with this guy or not?" or "should I tell him that I love him?" As horrid as this sounds, I want murder. I want lying. I want mystery. I want crime solving or legal dilemmas. I want the male leads to not be the kind of guys you melt over. My latest read was The Corruptible by Mark Mynheir, the second in the Ray Quinn mystery series. A book that fit all of those qualities I just mentioned. Ray Quinn is far from dreamy. He drinks too much. He only watches movies starring John Wayne. He's extremely sarcastic. He pushes the lines and bends the rules. He's an ex-cop turned private detective due to injury from being shot on the job. Think of Dr. House as a cop instead of a doctor. That's Ray Quinn. But, I like him! The book summary is below, so I won't spend a lot of time going over the details of the story itself. There are the moments of humor included along the way. Ray's sidekick is almost always a source of comic relief as he's learning the ropes. The man who hires Ray to find his missing client information is a germ-a-phobe, so to get the upper hand in the mind game the boss seems to be playing, Ray does a few things to kick the fear of germs into high gear. There's just enough of a tease at possible romance that evidently every book has to have. But it's just enough to give hope that even the most unlovable people can find someone to love them. I was honestly kept guessing the whole time about who the murderer was even though I figured out one part early on. Actually, I think that might have been set up that way to keep readers on their toes, now that I think about it. My only problem is that there were a few references to the first book that I couldn't remember much about since it has been three years since I read the first book, The Night Watchman. When I requested the book for review, I didn't realize that this book had already been out for a year or I probably would have gotten it sooner. Even with the references to his last case, I think you could read The Corruptible without having read the first book. Ex-homicide detective Ray Quinn never expected life as a private investigator to be glamorous—but being cornered in a bathroom stall by the enraged philandering husband of a client? That’s something he could live without. Retired from homicide and living with a painful disability, Ray’s options are limited. Stick to the job, keep impetuous sidekick Crevis alive, and spend quiet evenings with trusted pal Jim Beam, that’s about the best he can hope for. Ray stumbles across Logan Ramsey in a seedy motel room. Only Ray wasn’t the first to find him. Now Logan’s dead, the client’s information is nowhere to be found, and Ray’s employer is less than forthcoming with the details. Suddenly the line between the good guys and bad guys isn’t so clear. With a foot in both worlds and an illuminating look at an unhappy ending that could well be his own, which will Ray choose? Visit Mark Mynheir's website at www.copwriter.com. Click here to buy the book on Amazon or Christianbook.com. 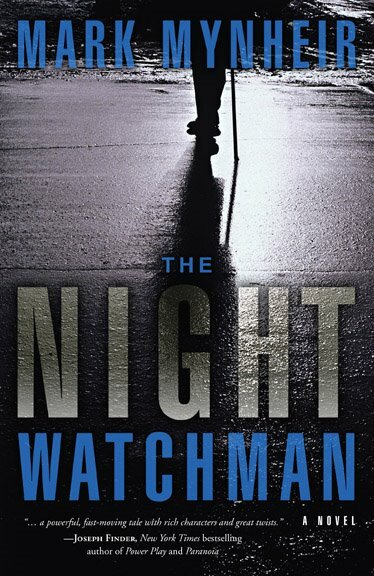 Also check out the first book in the Ray Quinn series, The Night Watchman. My review is here.